Easter Lily in the Perennial Bed? You Bet! Easter Lily planted in the perennial beds. Happy Easter weekend all! I know many of you will be getting the lovely Easter Lily (Lilium longiflorum) as a gift or maybe you have treated yourself to one, good for you 😉 The Easter Lily, a native to Japan, are mostly grown for the US, in the US and Canada. Unfortunately, many end up in the trash can and I would like to put a stop to that. The Easter Lily is a symbolic flower, said to have filled the Virgin Mary’s tomb 3 days after her passing when nothing else was present. Early writers, painters and poets made this flower the symbol of purity and grace and for that reason it is very fitting the for holiday of Easter. 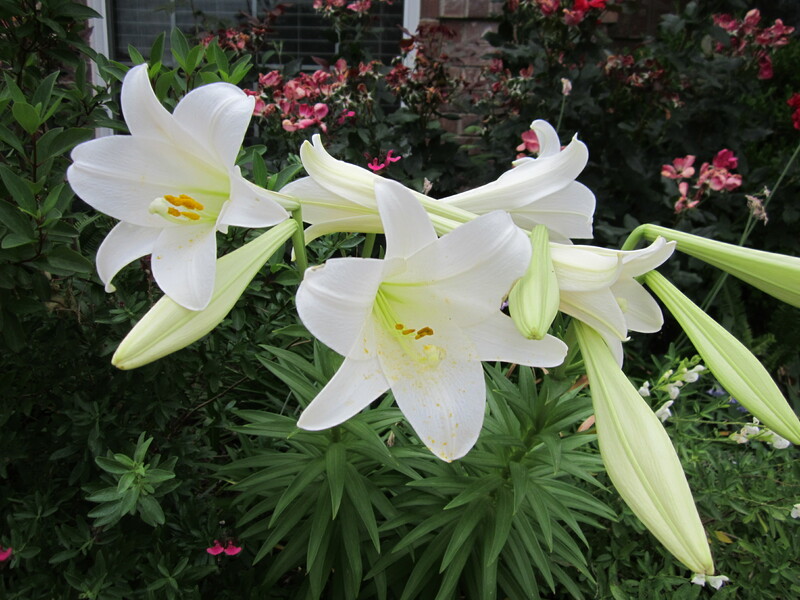 I purchased 3 Easter Lilies a few years ago after the holiday for about $.50 and took a chance that I could plant them in my Central Texas Xeriscaped perennial bed (morning sun from dawn to 1:00p.m.). I believe the garden is nothing if not an experiment of belief and patience. I was delighted to see their return the following year and was not only impressed by how lovely they were, but by how prolific the blooms and with each passing year the rewards are larger. Mixed among a bed of returning perennial color, my ever spreading Easter Lilies are ready to greet my holiday guests, butterflies, and even the Easter Bunny with open arms.